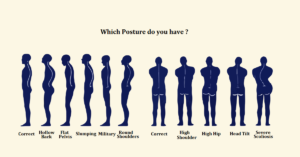 Assured Health GroupLatest BlogsExercisesWhat is Good Posture? Good Posture makes you look great, feel more energetic and project confidence. It also helps prevent injury and reduce pain. We all want good posture, but it can be so hard to achieve if you have poor posture. That’s because acquiring good posture involves not only learning new movements and positions but changing life-long habits as well. How to Achieve a good Posture? At Assured Health Group, Our registered Massage Therapist and physiotherapist will help you to maintain a good posture.